The Tesco Hudl vs. its Nearest Rivals. And what about the Argos MyTablet? Has much does a 6kW Wind Turbine Generate in a year? Here's a table to compare some of the slates and slabs that might attract your kids attention this Christmas - and for many car journeys into the New Year. For younger children videos and simple drawing, picture and learning games are important, while access to the internet is less of an issue. Many kids will not want to get to the world outside at all, and for those that do, parents will be keen that child-safe browsing is an important part of the design. This is the philosophy that has sustained these devices. They aren't necessarily quick, nor do they boast pin-sharp graphics. They don't run Android either which might offer a child opportunities to elude their parents' attention: the platforms here are specific to kids' needs. In some cases they do offer peer-to-peer play where children using similar tablets can play a game together within the house. 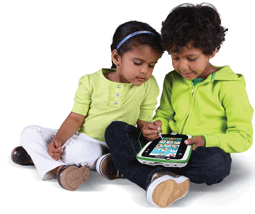 Older children will be keener on the performance of their gadgets, and on communicating with classmates over the web. We've prepared a separate page for that type of device. The devices here have a little extra rubber to cushion them from the inevitable knocks and bumps and rather smaller screens which are less likely to break. Generally, the models that come in pink for girls can also be obtained in green or blue or black for boys. Click on them to see what's available. Heavy-touch Resistive-type touchscreen. (Might be better for 2-4 years old) 4.3" 5" 7"